Looking for a cardio exercise which is low impact, easy on joints and bones and yet provide efficient cardiovascular benefits? Then Stair Climbing offers excellent options. Stair Climber, also called Stair Stepper is a proven performer to lose weight, improve heart health and endurance and yet safe. 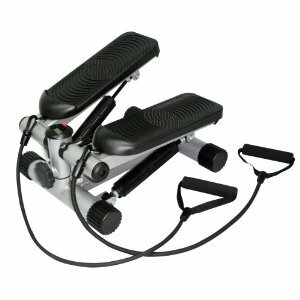 Also the steppers help tone legs and buttocks when you take deep steps and calves if you get on the toes. Stretch your lower back, shoulders, hamstrings and calf muscles for 3-5 minutes before you climb on a stairstepper. Ask the instructor to show a demo of the machine and learn how it functions. Get on the stepper and stand erect. Grasp the handrails of the stepping machine. I suggest you avoid leaning on the bar as it shifts weight forward and burns less calories. Start stepping, taking deep steps with your hands either on the railings or swinging them to burn additional calories. Gradually increase speed, step depth and for variation alternate between short and long steps.